House of Clan Battle-Born is the home to Clan Battle-Born. 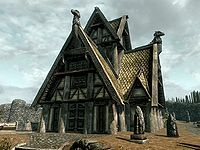 It is located in the Wind District of Whiterun, next to the Hall of the Dead. Across the street is the house of the Battle-Born's rivals, Clan Gray-Mane. There are two entrances to the house, the main door is up a flight of stone stairs and is often novice-locked, while the rear door is often unlocked. To the left of the property are three wooden benches surrounding a lit brazier. There are a couple of lavender bushes near the house. Entering through the front door, leads into the main room, with a large fire pit in the center and a cooking spit directly in front of you. On your left, in the western corner is a bookcase, two low chairs and a low table. On the bookcase are a selection of common books, several goblets that are found throughout the home along with, a bowl of tomatoes, and a plate holding two salmon steaks and a tomato. Beside it is a food sack. On the table is a bowl containing a gourd. Along the northwest wall is a long end table with a bowl containing two honey nut treats on top and a wooden bench to the right and further to the right of the bench is a wooden door into Olfrid's bedroom. On the other side of the door is a narrow table holding a haunch of raw venison on a plate and another bowl of tomatoes. In the northern corner is a cupboard holding a bottle of alto wine, some bread and a goat cheese wedge, with a long unlocked chest containing minor loot, coming along the northeast wall. In the middle of the northeast wall is the rear entrance and in the eastern corner is a set of shelves holding more household items, a couple of bottles of alto wine and a couple more common books. Either side of the shelves is a chair. Against the southeast wall is a small unit holding a bowl of potatoes, cups and a common book. To the right of this is a wooden door into Lars' bedroom, with a wooden bench to the right and a doorway beyond, that leads to the stairs and the top floor. 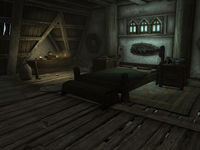 To the right of the doorway, in the southern corner is a square wooden table and two chairs, on the table is an unlocked chest holding minor loot, two goblets and a bottle of Nord mead. On the far side of the fire pit from the main entrance is a chair and small table pulled close to the fire. On this table is a bowl containing a goat cheese wedge and a goblet and between that and the rear door is a table laid for six people. On the table are six plates, with an apple pie, a sliced eidar cheese, a loaf of bread, a baked potato, a portion of grilled leeks, a joint of raw beef, two bulbs of garlic, a bottle of Nord mead and a bottle of alto wine. Lars Battle-Born's room is L-shaped and consists of an owned child's bed in the southern corner with an end table beside it. Opposite the bed, next to the door is a tall wardrobe containing fine clothes, jewelry and clutter. At the southeast end of the room there is a bookcase in the eastern corner holding five common books. Against the southwest wall is a long end table and chair with more common books, a flute and a sweet roll on top. Olfrid Battle-Born's bedroom consists of a king-sized four-poster bed, with an end table either side. On these is a silver jeweled necklace, a copy of The Cake and The Diamond, two goblets and a bowl containing two honey nut treats. Against the southeast wall is a dresser with a jug, two cups, a bowl containing a gourd and a pair of fine boots on top. To the right against the southwest corner is a set of shelves holding a copy of the Two-handed skill book Battle of Sancre Tor, several household items, a green apple, and a copy of Harvesting Frostbite Spider Venom. Against the northwest wall is a small unit holding a silver ingot, a potion of healing, a potion of plentiful stamina and more household items. In the southwest corner of the room is a door into his study. The study consists of a chair against the northwest wall, behind the door. In the western corner is a bookcase with eight common books, a copy of Imperial Report on Saarthal, a loaf of bread, with a small unit to the left holding more common books, a bottle of ale, a bowl of bread and other household items. Against the southeast wall is a large desk and chair, with a small wardrobe containing fine clothes underneath on the left. On the desk is a bottle of wine, a potion of healing, two silver ingots, a plate with two boiled creme treats on and if you have started the relevant quest an Imperial Missive. Above the desk are two wall shelves holding a silver ingot and a food sack, with another sack under the desk. Through the doorway to the stairs, on the left against the northeast wall is a cupboard with a sack on top. In the southern corner, against the southwest wall is a tall wardrobe containing fine clothes and against the southeast wall is a wooden bench. The stairs are opposite the wardrobe and have several crates and sacks underneath, with a leather strip on one of the crates. At the top of the stair is a small wardrobe with a bowl containing a sweet roll, a bottle of wine. The top floor is only partially floored out, with an area beside the stairs floored across the width of the house creating a sitting area, with a large round wooden table and two chairs. On the table are two plates, a baked potato, a portion of grilled leeks, an apple pie, a common book and a bottle of wine. Against the southwest eaves is a long end table holding a platter containing two potatoes, a tomato, a goat cheese wedge and four salmon steaks. The flooring continues along the northeastern edge of the house, past a narrow table holding several pieces of goat cheese and Jon Battle-Born's large bedroom on the right. Idolaf and Alfhild Battle-Born's large, well-appointed bedroom can be found at the end of the hall. That consists of a king-sized bed coming out from the middle of the northwest wall, with an end table on each side. On the end tables is a bowl containing four portions of grilled leeks, a bottle of weak poison, a goblet and a plate with an apple pie on top. At the foot of the bed is an unlocked long chest containing minor loot. There is another long end table in the western corner of the room. On top of this table is a plate filled with two baked potatoes, a bottle of alto wine and a couple of common books, there is also another plate underneath the end table. In the south corner is a square wooden table and two chairs. On the table are two plates, one holding an apple pie, while the other holds a goat cheese wheel, also on the table is a potion of healing and a bottle of alto wine. There is a tall wardrobe containing fine clothes against the southeast wall with a couple of sacks on the floor beside it. Against the northeast wall is a cupboard, a low table with a bowl of bottles of Nord mead and a washbasin. 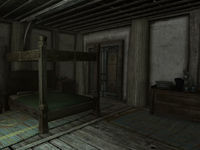 Jon's bedroom consists of a king-sized bed coming out from under the eaves to the southeast with a small low table on each side, these hold a common book and bottle of alto wine. In the eastern corner is a dresser containing clothes. On top is a philter of resist fire, a bowl of boiled creme treats, and a bottle of alto wine. In the middle of the northeast wall is a small square wooden table and two chairs. On the table are a couple of plates, two bottles of Nord mead, a long taffy treat and a piece of cheese with an open crate containing a worthless jug and five bottles of Nord mead. The northern corner has small set of shelves, on these shelves are five common books, a drum and bottle of alto wine, with a sack beside it. The center of the northwest eaves has a long wooden table against it. This has a lute, a potion of plentiful stamina and a bottle of alto wine on it. To the left of the table is a bookcase with several common books strewn on the floor in front of it and on the shelves. On your right as you enter this room is an unlocked chest containing more minor loot. There is a Protected shadowmark to the left of the front door, near the ground and to the right of the back door. Olfrid pledges the full support of the Battle-Born clan to the Thieves Guild once Imitation Amnesty has been completed. Despite the Protected shadowmark, you can still be required to steal items from this house by the Thieves Guild, as part of Vex's radiant thievery jobs. This page was last modified on 8 February 2019, at 09:41.